Thanks to our good friends at Blizzard Entertainment, we're offering The Escapist community a chance to join the epic battle against the minions of the Burning Hells in Act I of the Diablo III Beta Test. We have received hundreds of beta keys just for The Escapist Community, which not only give you instant access to all the Diablo III beta glory that you can handle, but they will be LOADED with 50 Beta Bucks upon registering. This allows you to immediately get down and dirty with testing Diablo III's new auction house trade mechanics for buying and selling in-game items. Yesterday, Publisher's Club members received early access to 100 of those keys and they can't wait for you to all to join them. Over the next ten days, we will be distributing hundreds of Diablo III beta keys in not one, but TWO contests. The first will be right here on our site for a chance to win one of one hundred keys and the second on our Facebook Page for a chance to win one of three hundred keys. One will test your knowledge of lore, while the other will test your knowledge of game mechanics. Enter them both for extra chances to win! The lucky winners can look forward to testing out all five hero classes -- barbarian, witch doctor, wizard, monk, and demon hunter, as they go head-to-skull against the Skeleton King. Taking him on alone, or with the help with other adventurers, while experiencing the latest game updates. Everyone knows an adventure is only as good as the story you tell, so Blizzard invites all of you to share the details of their quests with the world. To enter on The Escapist, visit the contest page here. Good luck! You must be a registered member of The Escapist and a Facebook Fan to access the contest. You can sign up for your free account on The Escapist by clicking here, or Login with Facebook. Visit The Escapist's Office Facebook Page & Diablo III Giveaway HERE. Correctly answer the questions below that test your knowledge on game lore from the Diablo franchise. Complete the form provided and submit your correct answers for entry. All contest submissions must be in no later than March 12th at 17:00 EST for a chance to win. Beginning March 3rd, winners will be drawn and notified for both contests from submitted entries every day at 17:00 EST. You may only enter each contest once. Your entry is valid for each drawing held after your entry form is submitted. 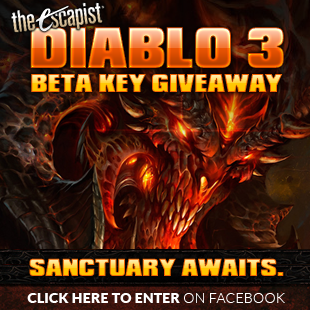 If chosen as a winner, you will be notified via PM on The Escapist with your unique Diablo III Beta Key. If a winner is not chosen after 3 attempts, The Escapist has every right to negate the unclaimed prize. On-Site Contest - one of one hundred Diablo III Beta Keys, each loaded with 50 Beta Bucks. Facebook Contest - one of three hundred Diablo III Beta Keys, each loaded with 50 Beta Bucks. 1. Log in to Battle.net. 2. Click on the "Account" button. 3. Select the "Add a Game" button. 4. Enter your Diablo III beta key and select the "Activate Game" button. 6. Select Windows or Mac as your operating system to download the beta client. 7. Select "Run" when the installation .exe pop-up box appears.